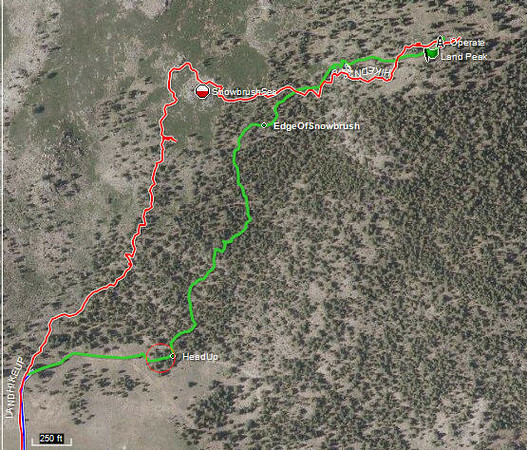 The green line is the GPS track of my hike up on this activation, while the red line is last year's hike up. The key to missing the Snowbrush Sea is to assure that you end up at or east of the EdgeOfSnowbrush point at 39.55547N, 120.19408W. If you begin hiking up into the forest from near my HeadUp point (39.55144N, 120.19614W) and follow the path of least resistance, you'll likely be fine. If you somehow still run into the Snowbrush Sea, then traverse to the right (east) to get around it.